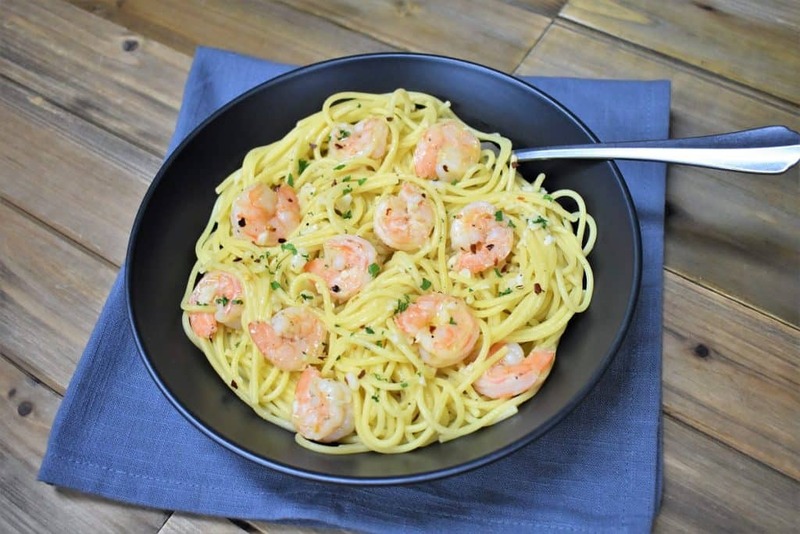 This garlic shrimp pasta recipe is one of our favorites for busy nights. It’s really easy to make and comes together quickly. In this pasta recipe, a generous amount of garlic is gently sautéed in butter and olive oil. Then we add white wine and cook the shrimp in this delicious sauce. This sauce isn’t done yet, we add extra flavor with fresh lemon juice, and a spicy kick with crushed red pepper. 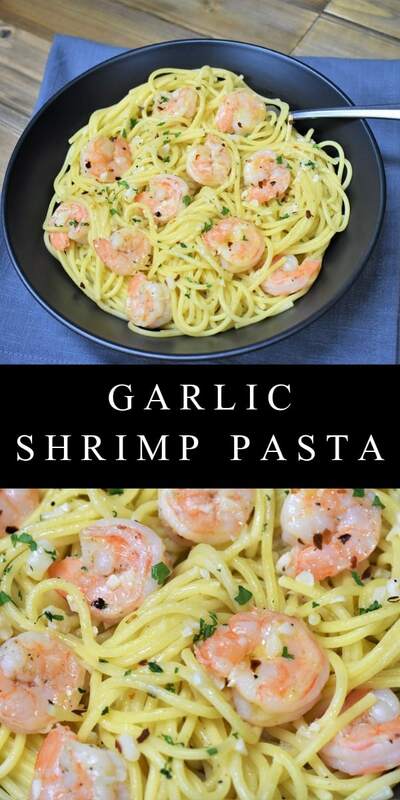 Serve the garlic shrimp over a bed of pasta and you’ll have a fantastic meal the family will really enjoy! Tomato and Olive Pasta – a simple, vegetarian tomato sauce with olives and plenty of flavor. Baked Chicken and Vegetables – a hearty comfort meal you can make on a weeknight. Steak Salad and Chimichurri Dressing – A salad that’s perfect for dinner since it’s topped with grilled steak. 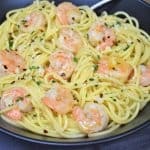 The prep on this garlic shrimp pasta dish is simple. 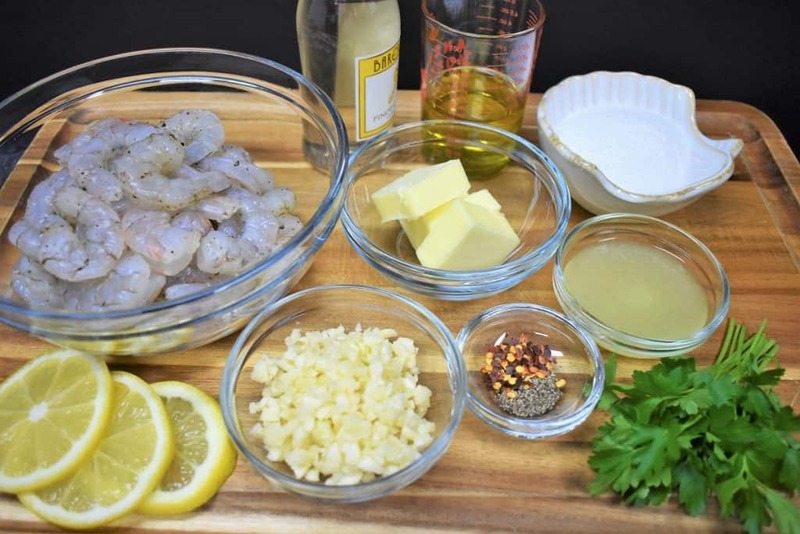 Once the shrimp is ready, it’s just a matter of mincing garlic and measuring out ingredients. To tell you the truth, I cheat on the peeling and cleaning the shrimp thing! I know that shrimp can be quite pricey, a splurge for most of us. So, we go for the frozen, easy-to-peel, deveined variety. When they go on sale we buy a couple bags. They keep in the freezer for a long time. If you’re using frozen shrimp, defrost by placing them in a large colander and run them under cold water while peeling them. Place the peeled shrimp on a large plate or pan and then pat them dry with a paper towel. Season them with a pinch of salt and black pepper. Next, mince the garlic and measure out the remaining ingredients. Once you start making this sauce, everything moves really fast. If you don’t have everything ready to go you risk burning your garlic. Let’s start by cooking the pasta, the shrimp only takes about 10-12 minutes from start to finish. It’s best to get the water going before starting the sauce. Fill a large pot with water and, cook the pasta to package directions for al-dente. See some helpful pasta cooking tips down below. Remember to add about 2 tablespoons of salt to the water after it starts boiling. Heat the olive oil and butter in a large, deep skillet over medium heat. When the butter is melted and foamy, add the garlic. Make sure the oil is not too hot. Garlic burns really easy and it becomes bitter and pretty much inedible. Cook the garlic gently, stirring almost constantly for 1-2 minutes. It will be very fragrant. Carefully, add the white wine to the skillet and stir. Cook the wine, simmering gently for 2- 3 minutes, stirring frequently. Raise the heat to medium-high and add the shrimp to the skillet. When the sauce starts simmering again lower the heat to medium. Cook the shrimp, stirring and turning them frequently for approximately 5 minutes. At this point, the shrimp should be almost cooked through. Keep in mind that the cooking time will vary depending on the size of the shrimp. When cooked through, shrimp will no longer be translucent, will curl, and will turn a soft pink color. Look for these signs, as they are a more accurate indication that the shrimp is done than the cooking time. Adjust the cooking time accordingly. Add the fresh lemon juice to the garlic shrimp. Stir and cook for 1-2 minutes, or until the shrimp is cooked all the way through. Add ½ teaspoon of salt, black pepper and crushed red pepper. Stir and taste the sauce. Adjust the seasoning if needed. Reserve about 1 cup of the pasta cooking water. Then drain the pasta and return it to the pot. I like to keep some of the pasta cooking water (even if I’m not using it for sauce) just in case my noodles get dry after draining. Add a little bit of the water to the pasta and stir. It loosens right up. Serve the pasta and top with a generous amount of shrimp and plenty of garlic sauce. Garnish the dish with chopped parsley. 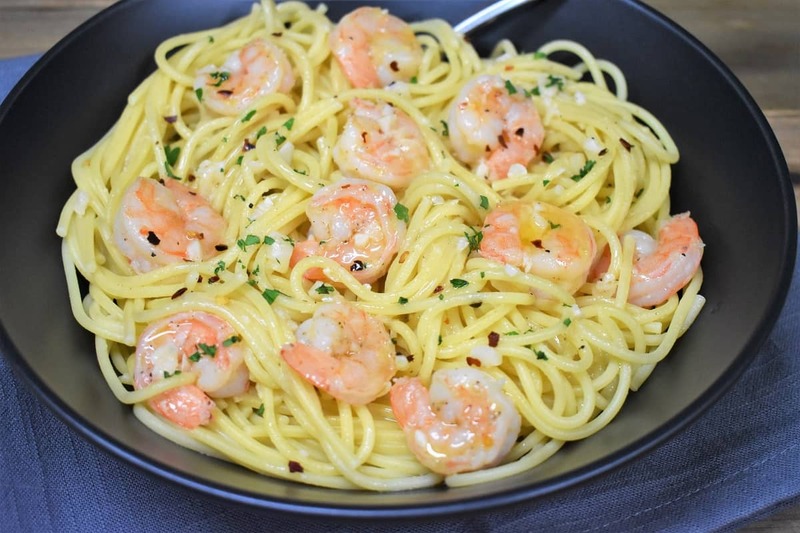 If desired, serve the garlic shrimp pasta with parmesan cheese and extra crushed red pepper on the side. Here are a few tips for making great pasta. We make it so often, might as well make it good. These have served me well through the years. 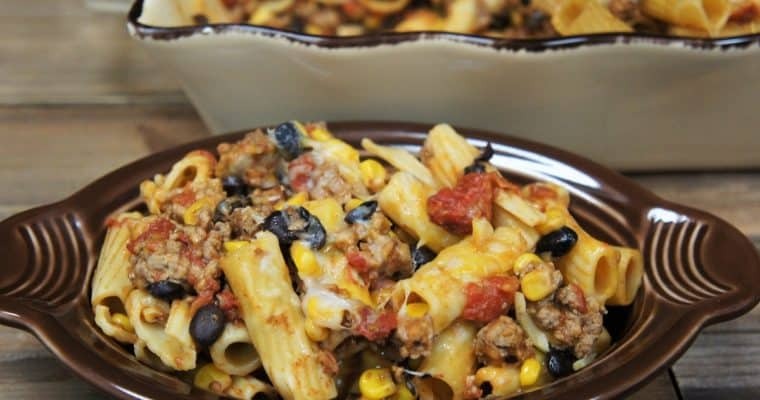 Cook pasta in a large pot with plenty of water to prevent sticking and uneven cooking. Stir the pasta often, especially when you first drop it in the water. Stirring will separate the noodles and prevent sticking. Add a generous amount of salt to the water once it starts boiling. It’s your opportunity to season the pasta. Don’t rely solely on package directions. Test the pasta about 2-3 minutes before the time recommended on the package. If it needs more time, give it more time. The residual heat will continue cooking the pasta a bit, even after it’s drained. Avoid overcooking pasta by removing it from the heat and draining when it’s still a little bit firm in the center (al dente). Finally, always reserve some of the pasta water before draining. This starchy water is great to loosen sauces. You may also need it for the noodles. Add a little bit of the pasta water to the noodles if they start to stick before you get a chance to serve them. They will become a lot easier to handle. That’s it. I hope you find these tips helpful. Enjoy your pasta!! Season the peeled shrimp with a pinch of salt and pepper. Fill a large pot with water and, cook the pasta to package directions for al-dente. Remember to add about 2 tablespoons of salt to the water after it starts boiling. Heat the olive oil and butter in a large, deep skillet over medium heat. When the butter is melted and foamy, add the garlic. Cook the garlic gently, stirring almost constantly for 1-2 minutes. Carefully, add the white wine to the skillet and stir. Cook the wine, simmering gently for 2- 3 minutes, stirring frequently. Raise the heat to medium-high and add the shrimp to the skillet. When the sauce starts simmering again lower the heat to medium. Cook the shrimp, stirring and turning them frequently for approximately 5 minutes. At this point, the shrimp should be almost cooked through. 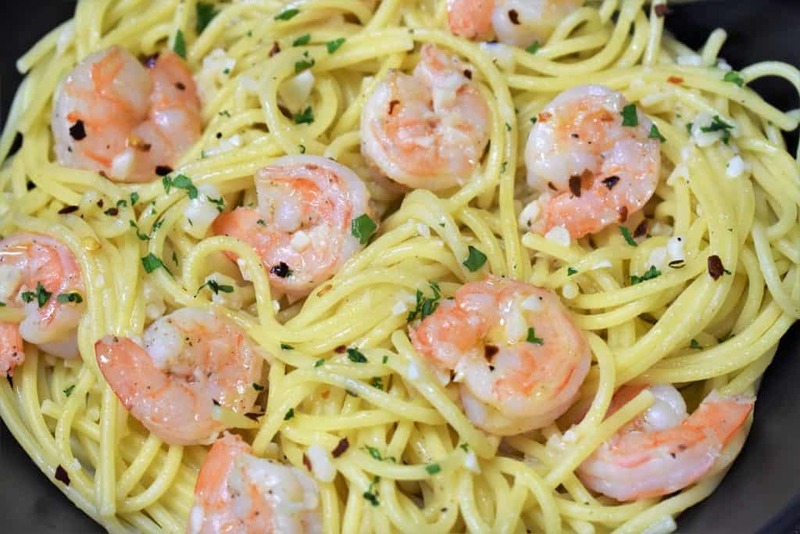 Serve the pasta and top with a generous amount of shrimp and plenty of garlic sauce. 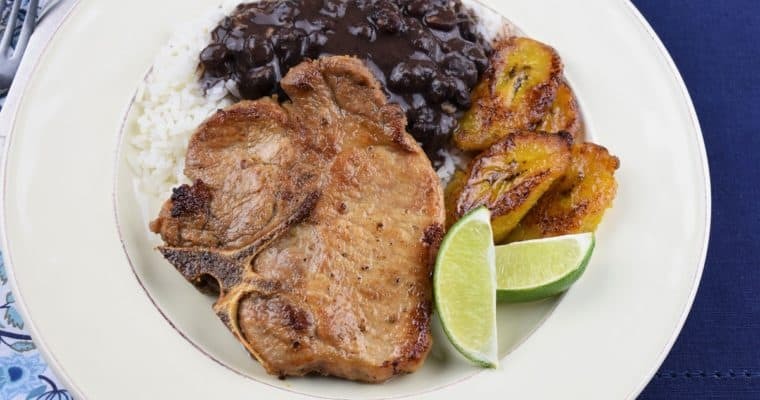 If desired, serve with parmesan cheese and extra crushed red pepper on the side. Keep in mind that the cooking time will vary depending on the size of the shrimp. Look for these signs, as they are a more accurate indication that the shrimp is done than the cooking time. Adjust the cooking time accordingly.